It is a cup-shaped valley called, “The Meadow of Flowers”. It is the finest and the most famous pleasure resorts in Kashmir. It is a lush green meadow sprinkled with flowers, a height of 2,650 meters above the sea level. It is at a distance of about 46 kms from Srinagar. The en route stations are Shalteng (7 kms); Mirgund (13 kms); Magam (23 kms); Tangmarg (38 kms) and Gulmarg (46 kms). 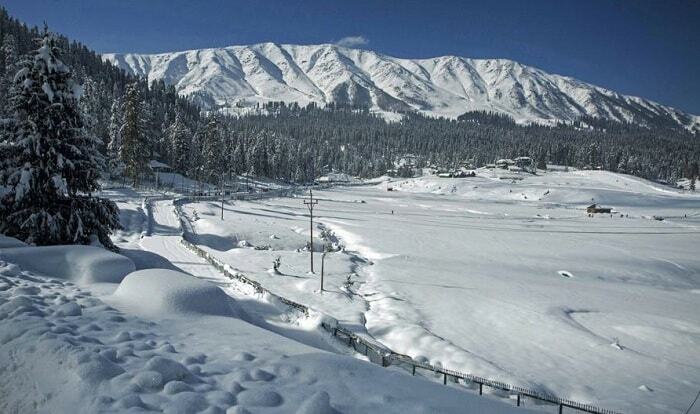 The alpine valley of Gulmarg has an undulating topography which adds to its scenic beauty and majestic charm. All the basic amenities i.e., hotels, market, boarding houses and transport etc. of a hill station are available at Gulmarg. The weather is delightfully cool even during the summer seasons, with intermittent showers of train, which far exceeds that of the valley. The green-carpeted meadows offer a beautiful view to the tourists and a perfect level of slopes to the golfers. In Gulmarg, there is also a 500-meter chairlift. A cable car project (Gondola) highest in the world is operating from this scenic spot. Gulmarg receives snowfall periodically from November to April, often above 15 feet and mostly gets the first and last snowfall in the valley. Gulmarg is a perennial scenic spot. The international golf course, at Gulmarg, is known for its green grass’ rolling gentle slopes and towering heights. The Golf Club was established in 1902 it is the highest golf course in the world. In winter, Gulmarg is the Playground for skiing. Gulmarg provides an excellent base for undertaking some of the most delightful treks. The Gulmarg Gondola Cable Car, the highest in the World connects Gulmarg with Kongdori and Apharwat (4080m) a famous ridge that offer breathtaking view of the area throughout the year. St. Mary’s Church atop a meadow built in 1902 A.D., Rani Temple and the Maharaja Palace are worth seen. A newly developed lake and a children’s park is quite fascinating. This seven Kms, circular road, girdles Gulmarg through pine forests. Once can have a panoramic view of the valley; the massifs of Nanga Parbat and Harmukh; and the rugged slopes of Ferozepur; sunset peaks and Apharwat ridge. A green meadow carpeted with wild flowers, is just 5 kms from Gulmarg, towards the western side. It is at the height of 3460 meters, carpeted with wild flowers. It is referred as a “Paradise for Botanist”. It affords a glorious view of the valley and its surrounding mountain ranges, which include the Naga Parbat. This triangular lake with floating ice, and connected with small tarns in its neighbourhood, is in the close vicinity of Apharwat Mountain. From Khilanmarg the lake is about 8 kms in distance and one can reach by foot or by the pony ride. The catchment area of the lake is full of snow round the year. It is at the height of 3843 meters. It is a shrine of noted Saint Baba Payam Rishi, about 8 kms from Gulmarg where devotees from all parts of Kashmir are seen throughout the year. It is a famous stopover en route Gulmarg. A short trekking route from Tangmarg to Gulmarg is very exciting. It is one of the most beautiful parts of the valley of Kashmir, that can be reached from Gulmarg via Ferozepur Nallah.